My mom has made this recipe for as long as I can remember. Something tells me the recipe originally came off the back of one of the ingredients somewhere back in the 70s. No matter, it still evokes childhood for me. Preheat the oven to 375F. Grease the bottom of a 13″x9″ baking pan. In a bowl mix to combine all ingredients except the pie filling. The mixture will be very thick. Place 3/4 of the mixture into the pan and press out so you have an even layer. Pour in the 2 cans of pie filling and spread evenly. Spoon the rest of the dough in globs on top of the pie filling. Swirl it around a bit. Bake for 50 minutes. For easiest removal allow to cool completely before cutting. 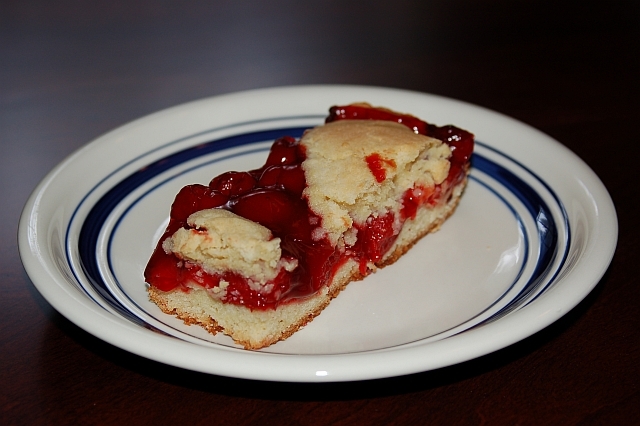 This entry was posted in Baked Good, Dessert, Recipes and tagged dessert, recipe by Bob Gill. Bookmark the permalink.